As many of you probably already know, the German art school, the Bauhaus, started in Weimar, flourished in Dessau and closed in Berlin. 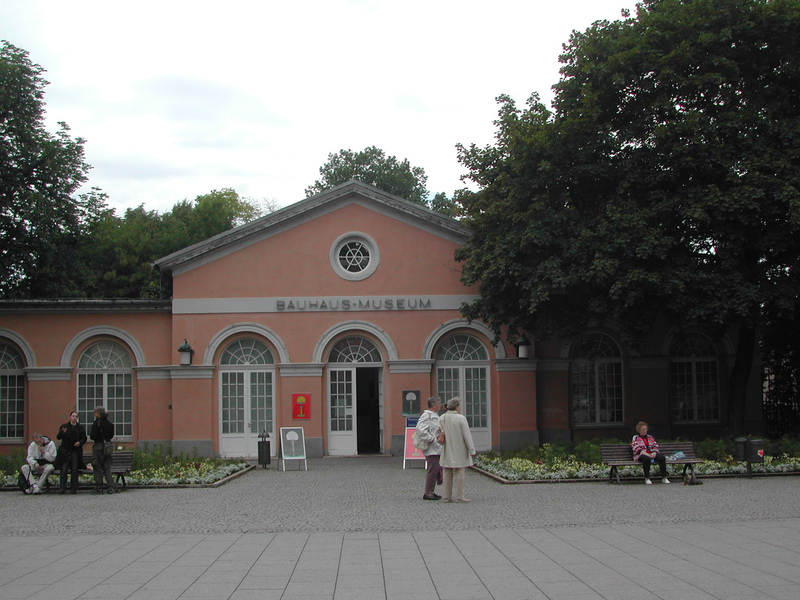 Today there is a museum at each site but in 1984, when we first visited the West Berlin location, it was forbidden to travel to East Germany. That was the era of The Wall, machine gun patrols and tedious hours at Checkpoint Charlie to visit the Pergamon in East Berlin. East Berlin was still riddled with bullet holes left from WWII and restaurants had menus with only about 25% of the printed offerings available. It all seemed so entrenched— it never entered our minds that in a few years there would be a free unified Germany. Even though the building was relatively new, at closer range the exterior was showing a bit of weathering. Inside the spaces were more conventional, and rather small—the exhibition contained entirely on the ground floor. The day we visited the museum was busy but it was still possible to see the work of the students and teachers without strain. (Certainly no where near as frustrating as wading through the vast mobs at the Bauhaus exhibition at the Museum of Modern Art, NYC in 2010). Described as the largest single collection of Bauhaus artifacts, the exhibit includes ceramics, furniture, sculpture, weaving, printing, bookbinding and our favorite, collage. There is a good selection of works by students and their teachers—Kandinsky, Itten, Schlemmer, Feininger, Albers and Klee. Every Bauhaus period is covered through either products or their prototypes for mass production, furniture, lamps, and chairs. Major highlights include Marcel Breuer’s Wassily Chair and cantilever chairs, leather and wicker armchairs from Mies van der Rohe and the famous Bauhaus table lamp designed by Wilhem Wagenfield. In the architecture section several hundred works are displayed along with models for the Fagus factory and the Dessau Bauhaus building. 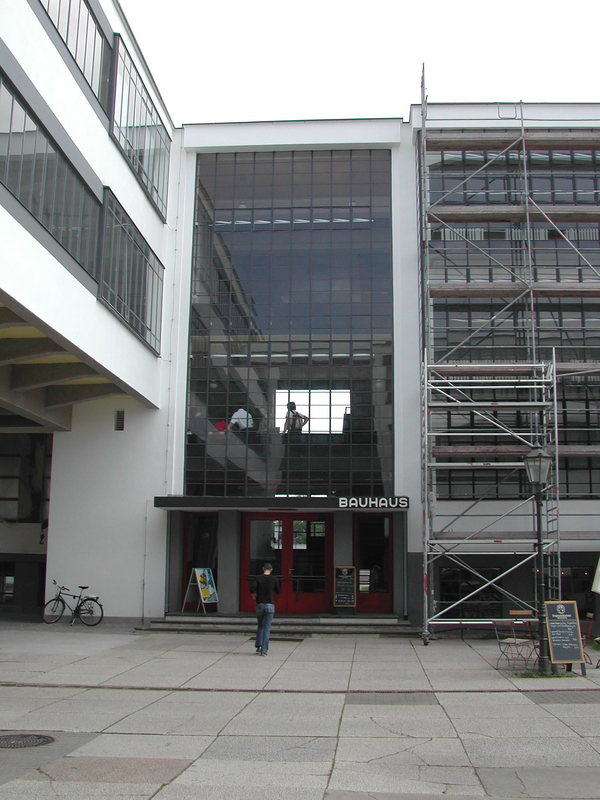 There is a gift shop where you can buy books and various Bauhaus products as well as a cafe with Bauhaus decor. We chose to refresh ourself elsewhere with a local speciality, Berliner Weisse, a beer flavored with raspberry syrup. YUM! Again an extensive exhibition of work by students and their teachers from its beginning in 1919. 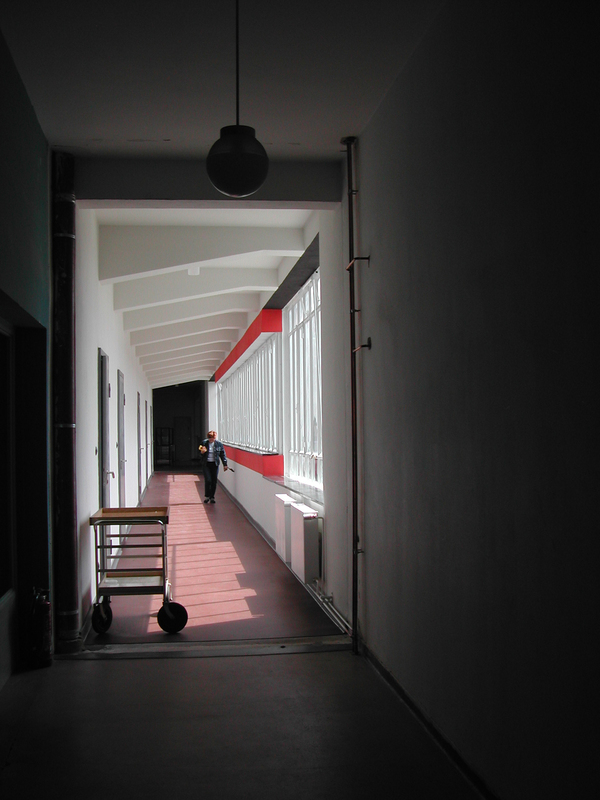 A short film covers the history of the Bauhaus in Dessau. Included are works from the Bauhaus predecessor, an earlier design school organized by Henry van de Velde in 1907. It is astounding how much work, some of it quite fragile, survived from the short 6 years that the Bauhaus operated in Dessau (considering the havoc of World War II and the political turmoil that followed). Less crowded and more serene than Berlin, this was worth the visit. There is a nice book shop and store. Afterwards we left the Modern world behind to visit the nearby Goethe House. In the film Bauhaus: The Face of the 20th Century, a former student laughs about how the Weimar Bauhaus students painted the statue of Schiller and Goethe red. 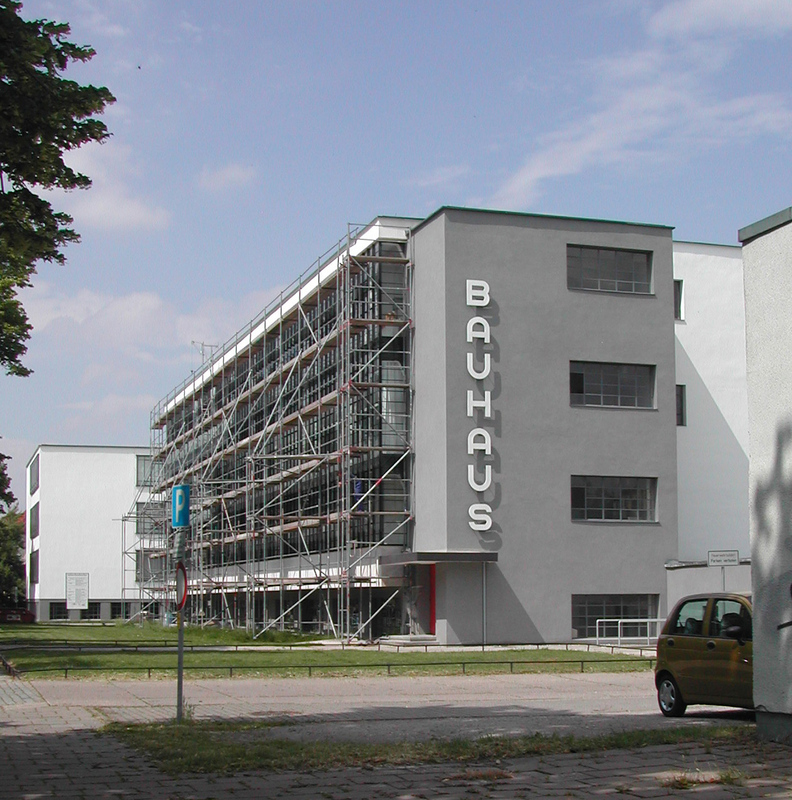 That sort of radical behavior and dangerous political currents precipitated the Bauhaus’s move to Dessau in 1925. 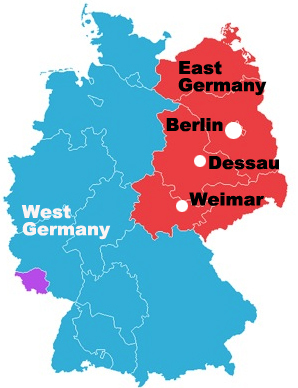 The school was eager to forge liaisons with industry which made the heavily industrial city of Dessau a good fit. Although not as picturesque (by a long shot) as Weimar, this is where the Bauhaus really flourished and the architectural innovations and design theories were executed as real building projects. It felt a little surreal parking in a lot a few hundred feet from the famous sign. 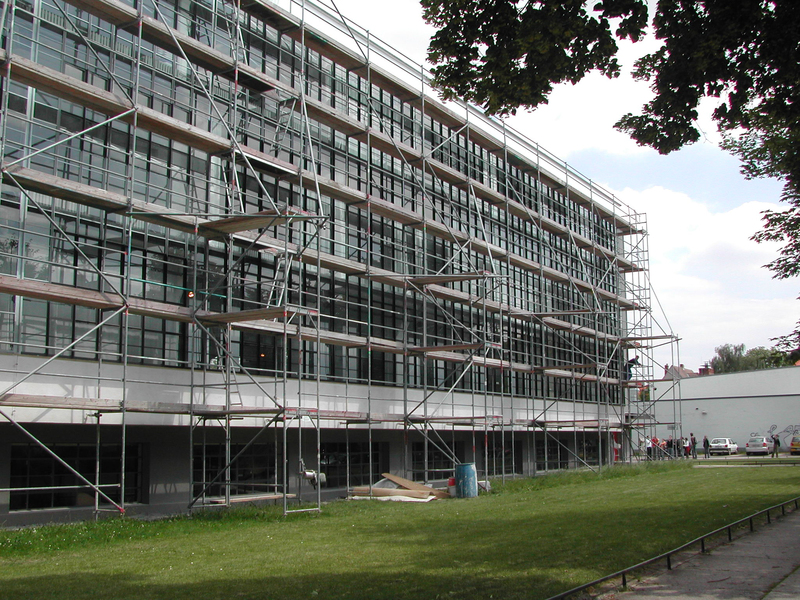 At that time the exterior facade was covered with scaffolding—repairs were underway with the influx of money from reunification. There were no tours available that day but we were pretty much free to wander around. The building was deserted, we could drink in the details of the fixtures, railing, especially the window treatments in this machine for learning. 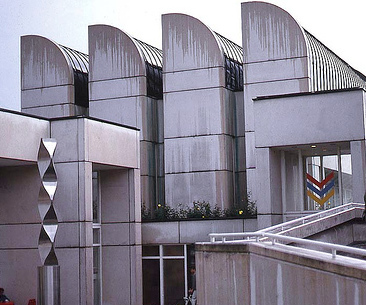 It felt somewhat familiar because so many of the (then innovative) building features are commonplace today. At the completion of our Bauhaus pilgrimage we drove off to Lutherstadt Wittenberg to visit the Martin Luther Museum. With so much renovation in progress the choice of guest-ready hotels was limited. The one we found had a delightful surprise, original handles designed by Walter Gropius in our room and about the building. At breakfast the next morning the owner told us that he was preparing to sell the originals — he needed the money to pay for the renovations and there was a great demand for original Bauhaus fixtures. He had no particular love for the handles, the mere fact that he never had the money to renovate before reunification had saved these Bauhaus artifacts. If you plan to visit Bauhaus sites in Dessau, someone has nicely placed all of the vital info on how to get around by public transportation.